Ryan and I were reading a wonderful book last month called "The White Cascade" by Gary Krist. 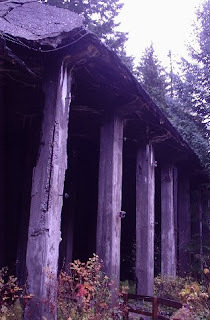 It contains the history of the building of the railroad through Stevens Pass and the 1910 avalanches that stranded two trains for more than 7 days and ultimately destroyed them. I had also read several years ago, a young adult book called, "Washington Avalanche, 1910" by Cameron Dokey which is a Historical romance and a fictionalized account of the disaster. In 1910, snowslides delayed two trains at the town of Wellington, in the Cascades just west of Stevens Pass. After more than 7 days, a vast section of snow broke loose and crashed down, sweeping both trains off the tracks and into the Tye Creek below. Rescue efforts were quickly organized, but 96 people died in the disaster. This tragedy made Wellington the site of one of the worst railroad disasters in the nation's history and also the most tragic snow avalanche. 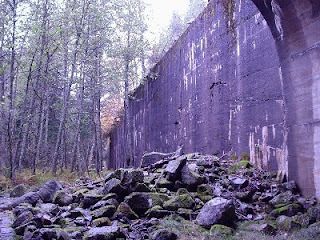 This prompted improvements to avoid such tragedy striking again and many snowsheds were built over the railroad line to protect it from avalanche damage. The name of the station at Wellington was even renamed Tye Depot so passengers would not associate it with the rail disaster. As rail traffic increased, a "new" Cascade Tunnel was completed in 1929. 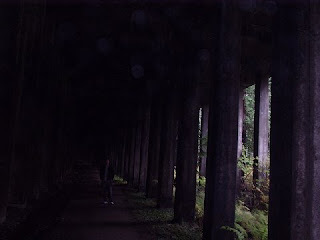 This eight-mile tunnel is still in use today by the Burlington Northern Santa Fe Railroad, and Ryan has even traveled through it on one of his many Amtrak adventures. The opening of the new tunnel in 1929, made the old grade obsolete and it was abandoned completely. 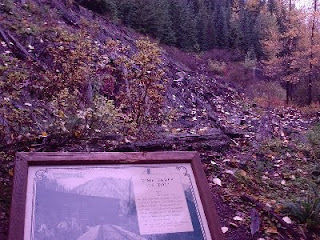 It is this abandoned stretch that makes up the Iron Goat Trail today. The town of Wellington was abandoned in 1929 when the new tunnel was completed. 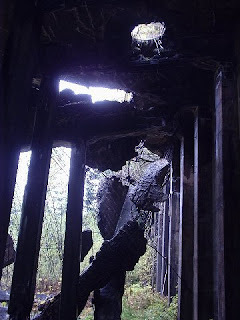 Ever since we read " The White Cascade", Ryan and I had been wanting to drive out to Stevens Pass and hike along the Iron Goat Trail to where the disaster took place. 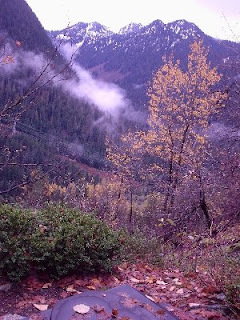 There are three trailheads currently along the Iron Goat Trail and they are continuing to convert the old railway to hiking trail further to the west. 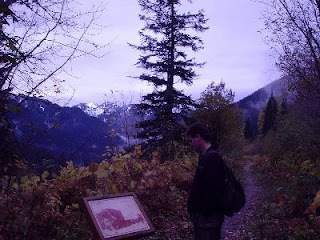 We decided to start at the Scenic Trailhead, because it was the easiest to access from the highway. Also Scenic has an interpretive center of sorts. 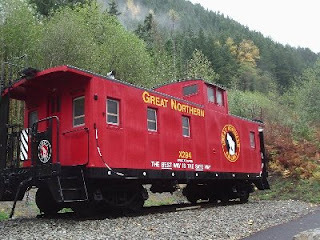 A bright red Great Northern Caboose is on display and there are information boards with photos of the building of the railroad, the disaster and the building of the current hiking trail. Also along the trail was one of the most scenic outdoor toilets that I have ever encountered. 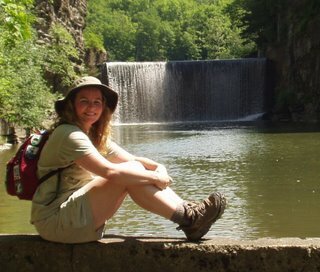 With Ryan's experiences on the AT, he has seen many scenic outdoor privies, but I don't encounter them that often and this one had a spectacular view! The black corner at the bottom of the photo is the seat of the toilet . I added Pictures of the Concrete Snowshed for Ryan!